Acqume (left) has repaid the decision to keep her racing with victory at the Gold Coast. 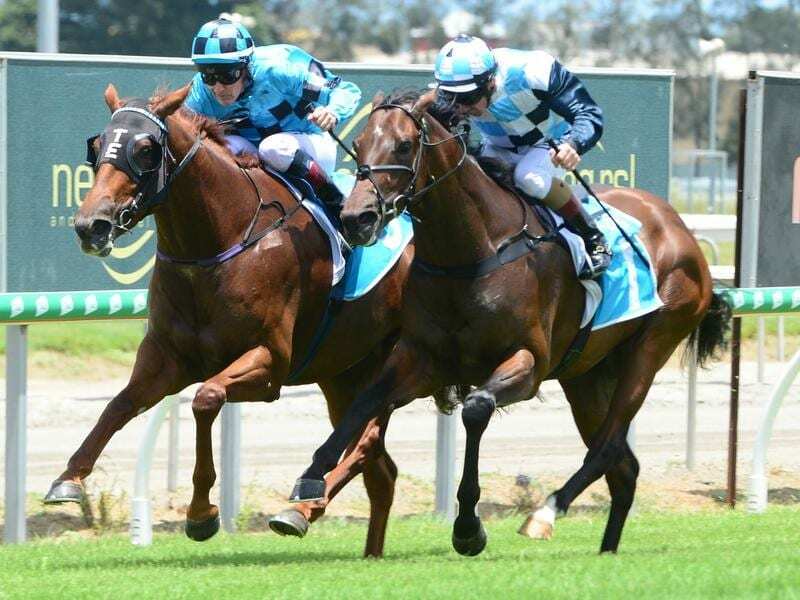 The Aquis group’s decision to race on with well-bred mare Acqume paid dividends when she won a race it sponsored at the Gold Coast. Acqume ($2) got up on the rail beat Boom Chicka Boom ($6) by a neck with 1-1/2 lengths to I am Queen ($4.60) in the Aquis Farm Pre-Training and Agistment Plate (900m). The mare, who is by Golden Slipper winner Sepoy, was bought by Aquis at the Magic Millions Broodmare Sales in June with a stud career in mind. But first she was sent to trainer Toby Edmonds at the Gold Coast with the idea of winning some races. “She really needs to win some stakes race so we will look at what is coming up later in the season and tailor her program towards them,” Edmonds said. Jeff Lloyd handled Acqume to perfection as he rebuilds his association with Edmonds. “A few of our riders are out injured so it is good to have Jeff back,” Edmonds said. Lloyd has delayed his retirement by at least six months after originally being expected to retire in December.